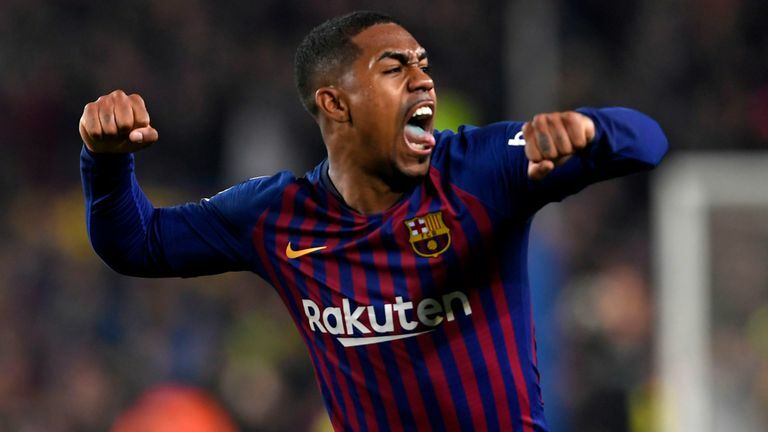 Agency, 7 February : Malcom’s spectacular equaliser earned Barcelona a draw against rivals Real Madrid in the first leg of their Copa del Rey semi-final at the Nou Camp. Real went ahead through Lucas Vazquez in the sixth minute following a brilliant assist from Karim Benzema. Holders Barcelona, who started without Lionel Messi, had stuttered in attack despite the efforts of a bright Malcom. And the Brazilian deserved his goal to line up a mouth-watering second leg at the Bernabeu on 27 February. Barcelona, who are aiming for their fifth Copa del Rey in a row, lacked fluidity going forward – and the inspirational Messi who was left on the bench after an injury scare. And with Gareth Bale also left on the bench for Real it was two Brazilian youngsters – 18-year-old Real forward Vinicius Junior and Malcom, 21, who took centre stage. Vinicius, who joined from Flamengo for £38.7m in 2018, caused plenty of problems for Barcelona’s defence with his pace and dribbling. He set up Real’s goal – delivering a cross from the left to the feet of Benzema who passed to Vazquez for a simple finish – and had more shots (four) in the first half than the entire Barcelona team. Malcom’s wicked curling free-kick found Ivan Rakitic who headed against the crossbar in the 31st minute. The former Bordeaux forward then pounced for the equaliser in the 57th minute following a scrappy period of play which saw Real goalkeeper Keylor Navas block a charging run from Jordi Alba. Luis Suarez picked up the ball and saw his shot blocked on the line before Malcom brilliantly smashed home the rebound. Messi came off the Barca bench on 63 minutes but, despite plenty of threat, could not help his side find a winner.